Just in time for the start of the 2017 Major League Baseball season, crews have completed installation of an all-new playing surface for the Tampa Bay Rays at Tropicana Field. The new TruHop Triple Crown synthetic turf system is the latest innovation from Shaw Sports Turf. To meet the Rays performance requirements, Shaw Sports Turf developed a surface which features a combination of monofilament fibers, slit film fibers and a thatch layer. Shaw’s HP+ monofilament fiber is made with a high quality resin that has a thick, diamond cross-section (no spines) to prevent premature wear, such as fraying and splitting. In fact, it has not had a fiber failure to date. It excels in performance characteristics (ball roll and ball rebound) and is known for mirroring the aesthetics of natural grass to create a visually stunning field. The slit film fiber is a high performance resin with superior durability, providing performance with a fiber that will stand the test of time. The thatch layer minimizes infill movement and migration to other areas of the field, providing extra protection against inconsistent and unsafe surfaces. All three fibers are run through one needle; a process no other synthetic turf company has been able to replicate. This patented manufacturing process is extremely important in avoiding streaky fields which are created when manufacturers use three fiber types, but cannot run them all through one needle. Other manufacturers are forced to create alternating rows of different fiber types. Each of these fibers has a different look, so when rows are alternated, the field has a streaky look. TruHop Triple Crown eliminates this problem and provides a strong, hard-wearing surface that looks great and can meet multi-sport performance requirements. The turf pile heights and infill mix of sand and rubber provide a firm surface that will give a fast and consistent bounce of the ball, mimicking the characteristics of natural grass and clay. The high sand content with the thatch layer will minimize infill migration, and the rubber, combined with the shock pad underneath the surface, will provide shock attenuation for the safety and comfort of the players. Six major factors were weighed and studied while designing the system. GMAX measures the impact attenuation of the surface. Force reduction is the amount of force absorbed by the surface. Vertical deformation is the depth that cleats sink into the surface. Ball roll is the length of the ball roll, in meters, from a drop of one meter. The coefficient of restitution (COR) is the amount of kinetic energy (motion) lost after impact. If the COR is low (close to zero), it suggests that a large fraction of energy was absorbed by the surface. Angle of restitution is the percentage of the outgoing angle of the ball vs. the incoming angle of the ball. All these tests were done to develop a system which most closely replicates natural grass in all of the categories which were tested. 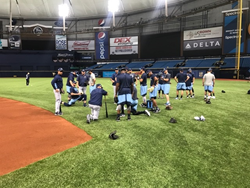 The Rays play the first game of the 2017 Major League Baseball season this Sunday, April 2 against the New York Yankees at 1:10 p.m. at Tropicana Field. To view and download footage of the new turf system being installed through a time-lapse video dated February 27 to March 27, visit https://www.dropbox.com/s/mn7kdys2h3hdy77/Rays_NewTurf_Timelapse_FULL_2017.mov?dl=0 and for b-roll footage, visit https://www.dropbox.com/s/k6qfsqi55o6zkf5/Rays_NewTurf_Broll_2017.mov?dl=0. A wholly-owned subsidiary of Berkshire Hathaway Inc., Shaw Industries is a full flooring provider to the residential and commercial markets. Shaw supplies carpet, hardwood, laminate, resilient, and tile/ stone flooring products, as well as synthetic turf. Shaw Sports Turf is one of the leading synthetic turf companies in North America and has represented quality and innovation for more than two decades with over 1,500 successful installations, including an impressive list of high-profile field installations. For more information, please visit http://www.shawsportsturf.com, call 866-703-4004 or find us on Facebook.